For the Di2 setup on the Dahon MuSP, it will be mostly an internal routing setup. The stock Dahon MuSP rear brake cable and rear derailleur cable are internally routed through the frame, giving a clean appearance. Using the same concept, the new rear brake cable and also the rear derailleur Di2 wire will be routed internally through the frame. 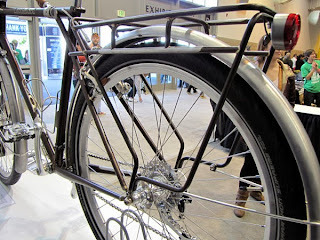 How about the cable routing at the front of the bike? The usual set up on a road bike is to have a Di2 Junction A situated under the stem, with the shifter Di2 wires connected to this Junction A. This is the stock condition on the Canyon Endurace. However, this is not a conventional bike, and so the usual Di2 wire routing is not advisable. 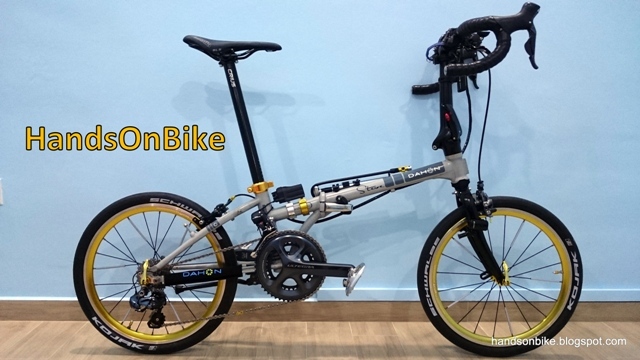 On the Dahon MuEX, which is also a folding bike, there is a display screen on the handlebar, so the shifter Di2 wires will be connected to the display. Also, in keeping with the internal routing concept, I would like to keep the Di2 wiring as neat as possible, which means hiding it internally where possible. With that, I considered something that I have never tried before, which is to run the Di2 wire inside the handlebar! 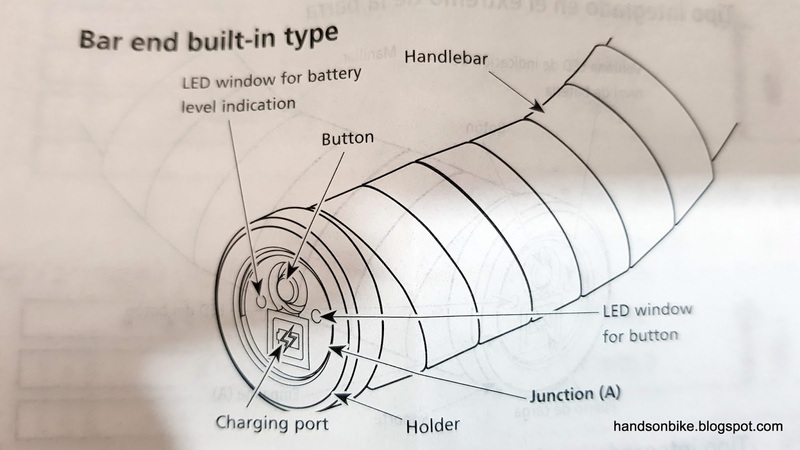 The concept is to hide Junction A inside the bar end for a clean look, and this is made possible by the new type of Junction A as shown below. Other than that, the wireless unit, EW-WU111 will also be hidden inside the handlebar. Finally, I will use a Garmin display to show the selected gear on the Garmin screen! This setup will maintain the neat appearance and yet allow the selected gear to be displayed. In order to run the Di2 wires inside the handlebar, there will need to be some holes on the handlebar, so that the Di2 wires can be connected between the shifters and Junction A. I thought of buying a PRO handlebar with pre-drilled holes, but they were quite expensive and did not have the size that I needed in stock. 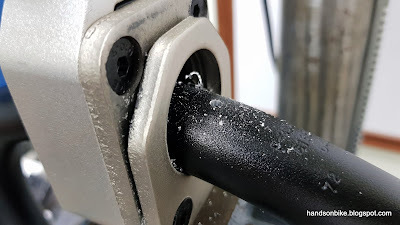 I came across a Youtube video showing how to drill holes in the handlebar for Di2 wiring. This might sound unsafe, but the area where the small holes will be drilled are not under high stress, and so from my point of view it is safe. Obviously this will void your warranty, so do it at your own risk. 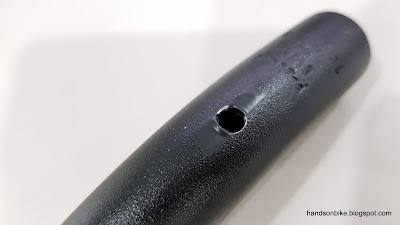 Lastly, don't do it on a carbon handlebar, as it is more risky. Using the Youtube video as a guide, I did my own DIY internal routing on the handlebar! FSA Vero Compact road handlebar, 40cm wide. 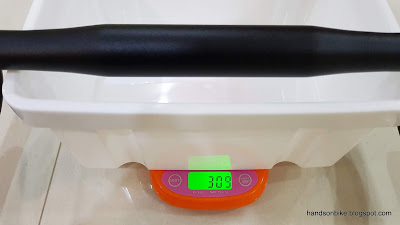 Weighs 309 grams which is much heavier than a carbon handlebar that is around 200 grams. Time to drill the holes at the end of the drop bar! 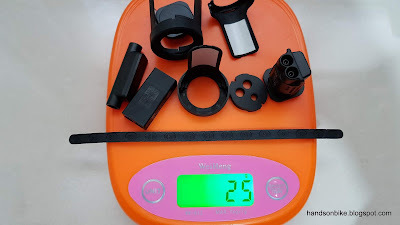 For this 1x11 speed Di2 setup, I actually only need to drill one hole on the right side. However, as I want to control the Garmin with the hidden buttons on top of both the left and right shifters, I decided to also connect up the left shifter. 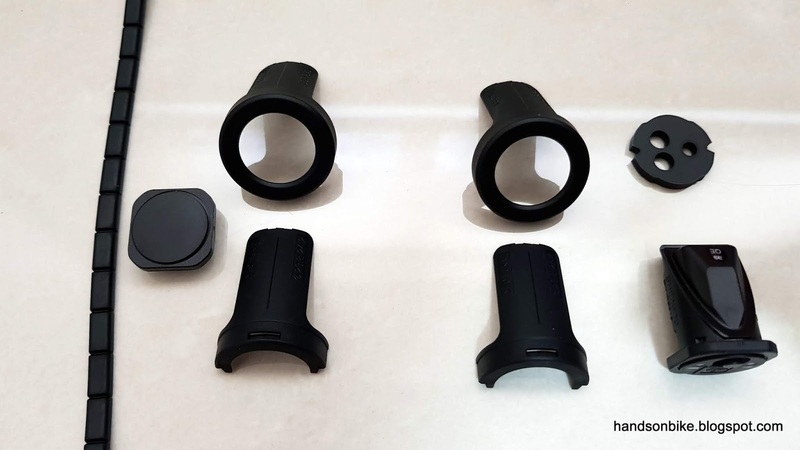 This also gives the option of customizing the function of the shifting buttons, such as using the right shifter button for shifting up, and the left shifter button for shifting down, much like the SRAM eTap system. Clamping the handlebar before drilling a hole. Start with a small drill bit to fix the hole position first, before changing to a larger 6mm drill size. The edges of the holes are also taped up to help prevent the Di2 wire from being damaged by the edge of the hole. With a similar hole drilled at the other end, this DIY internal routing handlebar is done! It is actually quite easy once you know the technique and have the right tools. 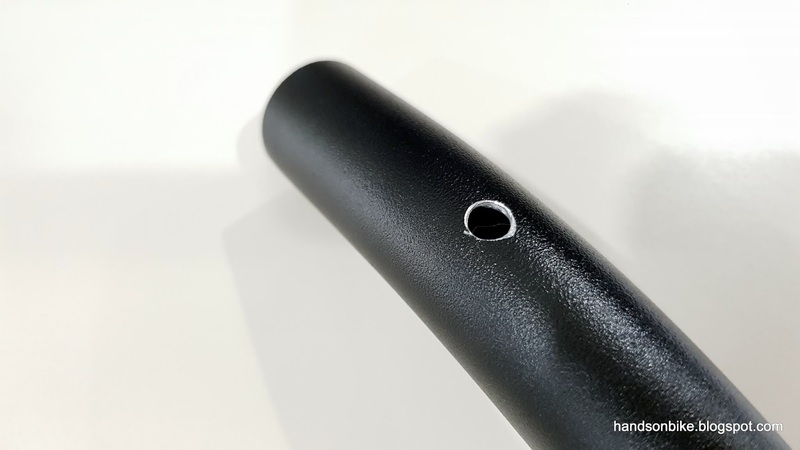 By the way, this is the underside of the drop bar, which is normally under compression load and so it is not a danger to have a small hole drilled there. As the handlepost is a T-shaped type, a stem is needed to link the handlepost to the handlebar. This is the exact same Controltech stem which I used last time on the Dahon Boardwalk. 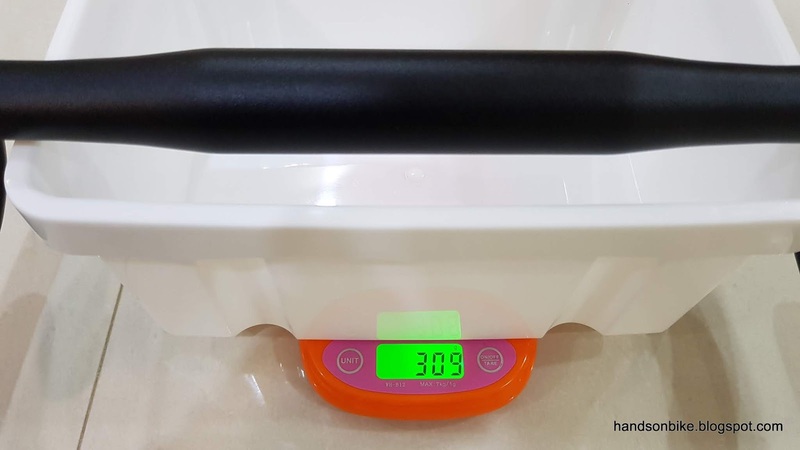 This stem converts the 25.4mm diameter of the T-shaped handlepost to the 31.8mm diameter of handlebars, while allowing reach and height adjustment at the same time. The normal Litepro stem requires a 25.4mm diameter handlebar, which is not so common nowadays. Therefore, using this stem allows most road handlebars to be used, which increases your options greatly. For internal routing through the handlebar, an internal type Di2 Junction A is required. This is quite new, and it is the first time I am using this type of Junction A. 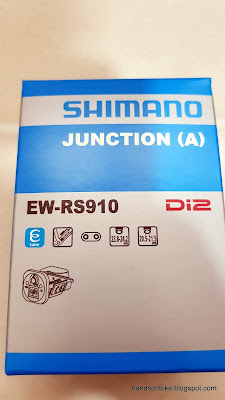 The other types of Junction A are the EW67 (used on Dahon Boardwalk and Merida Scultura) and the 3 port EW90 (used on Merida Scultura and Canyon Endurace). 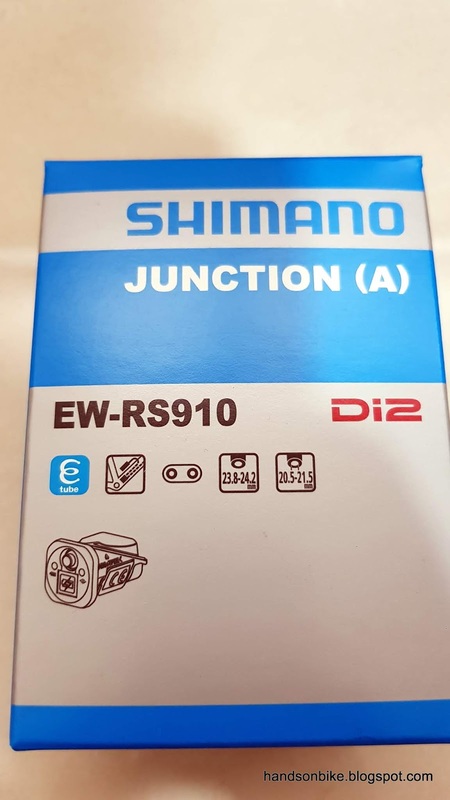 Internal type of Junction A, EW-RS910. This Junction A can be installed at the bar end of the drop bar, or inside the frame (if the frame is designed for it). If used at the bar end, the bar tape will be wrapped on top of it. The mode button and the charging port can also be found on the exposed part. 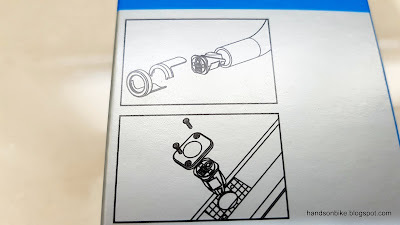 If you have an internal Di2 battery, you will need to charge it using this port. 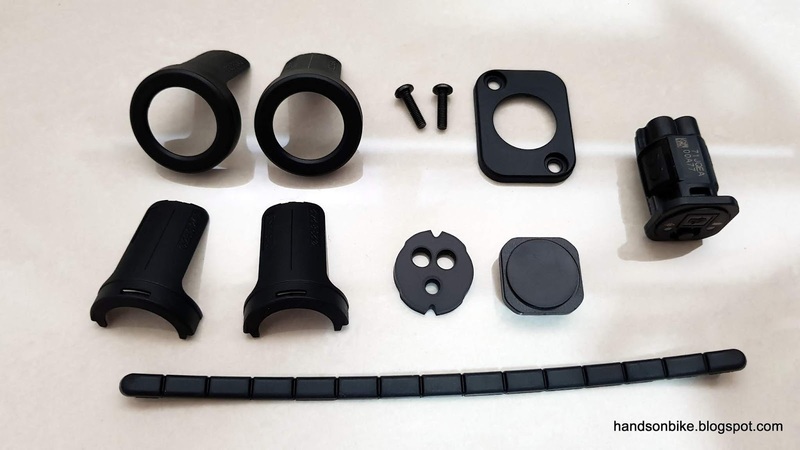 All the parts that are included with this Junction A set, including those for internal frame mounting which I will not need. Parts required for left and right side. The left side parts is just to make the bar end look similar to the right side, it is not compulsory. There is even a dummy wire (left side of picture) to wrap under the bar tape, to make the grip feel similar to the right side. Weight of Junction A plus the other small parts weigh 25 grams. Before installing the Di2 wires into the handlebar, I will first need to connect up the whole system to make sure it is working properly. That will be done in the next post where the bike assembly will start!